Patterns for related tray-railed 'China Tables' featured in Thomas Chippendale's Gentleman and Cabinet-Maker's Director, London, 2nd ed., 1755, pl. XXXIII. 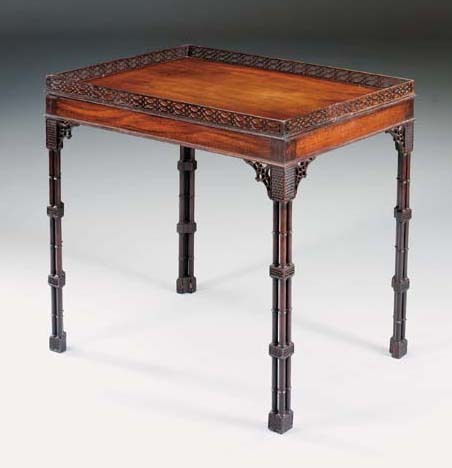 Related tiered pillared legs, likewise tied with tablets imbricated with 'Venus' dolphin-scales, feature on a suite of drawing-room seat furniture supplied in the late 1760s to Padworth House, Berkshire (see Major C. W. Darby-Griffith, 'Padworth House II', Country Life, 23 September 1922, p. 376, figs. 11 and 12.